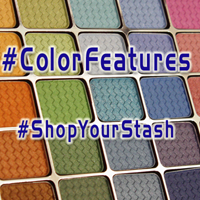 In May 2010, Aromaleigh v1 had a second “garage sale” to clear out old inventory - including shadows from previous LE collections that had not “made the cut” to become permanent, a few shadows here and there left over from older collections, and so forth. The shadows went for $6 per 5-gram jar - which included the shipping costs. I got a few jars, but also hit some of the “clearance” jars from 2009 LEs.